Self defense is one thing that you will hear me preaching over and over. And the use of firearms in your self defense repertoire is, in my opinion, the most effective for what I am pretty sure we are about to face. 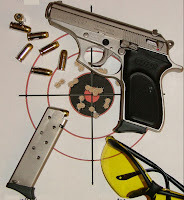 Being able to shoot effectively and accurately will save lives, as well as saving precious ammo. Making every shot count will be a life saver! Try these drills. This method works! In all my years teaching firearms techniques, I have found that my students have the most difficulty with aiming because they really don't know where to put their focus. Front sight focus is absolutely the key to having the ability to shoot consistently and accurately. Your eyes have muscles and nerves that enable them to move and focus. Doing these drills builds muscle memory. So don't be afraid to begin slowly. By being slow and deliberate, you will do things the same way every time. Doing these movements slowly and deliberately will cause your eye muscles to learn and "burn in" the desired motion and function. This will allow you to begin speeding up these movements, and work up to acquiring your target more quickly. You will find that by repetition, you will be able to acquire targets more quickly, make defensive decisions more quickly, and shoot more accurately.